"Whether licenses or citizenship, our drive is not a piece of paper; it's our rights and dignity." A delegation of 10 Migrant Justice members and a representative from the Vermont Workers' Center traveled to a groundbreaking gathering of over 300 immigrant worker leaders across the country in Washington, D.C on February 12th and 13th. The gathering took place under the banner United Workers Congress, which is a national network of grassroots immigrant worker organizations who are excluded from fundamental human and workers' rights. The mission was to build a more unified movement for immigration reform that creates a path to Citizenship for the entire 11 million undocumented people in this country, and upholds fundamental human rights for all. Tuesday 2/12-- Hundreds of immigrant workers gathered to work towards an agreement on four broad principals for fair and comprehensive immigration reform (shared below in our TAKE ACTION). 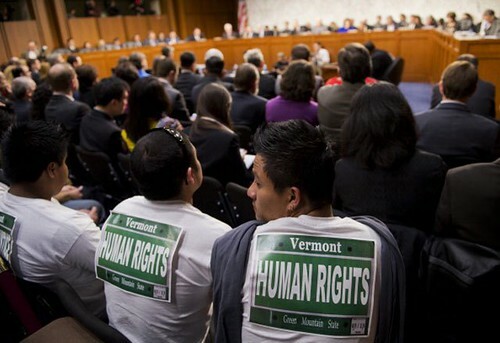 We want a path to citizenship for the 11 million (which include many of our farmworker friends, neighbors and family members in Vermont) and will not put up with more criminalizing and dehumanizing enforcement measures! TAKE ACTION for Human Rights for the 11 million!